Good news tonight that Chancel Mbemba’s visa has come through and he will be available to play against Borussia Monchengladbach in the final friendly of the season tomorrow afternoon. The game kicks off at 3:00 pm at St. James’ Park and it will also be the home debut of new striker Aleksandar Mitrovic. So it should be a treat for those fans who can make it to the game tomorrow to see our two new signings in action. Newcastle United can confirm that due to the nature of Saturday’s pre-season friendly against Borussia Mönchengladbach, the Club has obtained the necessary permissions in order for Chancel Mbemba to be involved in the squad to face the Bundesliga outfit. The Club would like to thank Anderlecht for their co-operation in this matter. The player has an appointment overseas in midweek to make his formal visa application, which the Club expect to be issued in order that he can be available for selection for the Magpies’ first game of the Barclay’s Premier League season against Southampton. Cash turnstiles will be in operation at St. James’ Park for Saturday’s game (kick-off 3pm). It’s also good news for coach Steve McClaren, who will also be hoping to have Fabricio Coloccini fit to play for the first time this pre-season. If both Coloccini and Mbemba can get 45 minutes in tomorrow afternoon with no ill effects, they could be the starting central defense against Southampton a week on Sunday. what is with all the colback hate o nthis blog? aside from Perez and janmat he was the only guy that busted his ace all year for us, regardless of the score of the game. Will we start Mbemba tomorrow?? Colback Hate? I don’t hate him. I think he’s a very nice lad. He seems to like being a Newcastle player which gets him a lot of points as a mackem refugee. Tomorrow’s game starting to look tempting for a £15 walk in like.. .
who cares about austin?? ?, why spend 15m for a guy that wont start ever game. How are we all?! 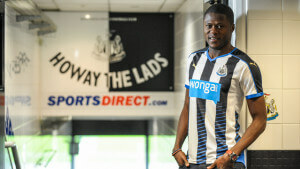 Looking forward to seeing Mbemba turn out in a toon shirt! I feel he is going to be a star for us! I’ve heard it’s a done deal as well Austin to the toon for £14 million. if this team was managed normally, yes of course, i think austin is actually a little underrated. I have no idea why english guys a year or two younger are rated so much higher. HOWEVER, this is not a normal team. Cash is limited and we may only make one more splash. Lock up the CB and everything after that is gravy. I dont want austin used as an excuse why we didnt get a CB. that is the real need. We have 3 quality players than can play CF. We only have 1 CB for 2 spots. Where is everyone getting these Austin rumors??? I for one would be over the moon if Austin signs. Tudor, I’m not saying I’m remotely in the know but I heard it from inside the club. To be fair I don’t think we need him either, I’d rather see us sign a winger and another CB from the EPL or Abdendour. We have 5 CB taco mate just 3 of them are useless and the other 2 untested, so I agree we could use a proven CB in our squad deffo. I personally think we’ll be okay at CB proving Mbemba comfortably transitions to the premier league and Colo stays fit and keeps his head in the game all through the season. The visa hasn’t come through. He’s still an Anderlecht player. They have given special permission to allow him to play in the friendly. He could probably have left the country yesterday to go and get his visa, but then wouldn’t have been back in time for the game, so he’s going during the week. Seems to have gone quiet on the Surprise signing. If Austin turns up that’s no surprise. So who is the mystery man yet to be signed, yet to be unveiled. Any news , any ideas ? Great news, makes me look forward to this game even more!! Will we see the colo, Mbemba partnership? I really hope so. Colo might thrive off of an athletic partner. Especially one who is quick enough to watch the huge hole Colo leaves. Get a new CB and Austin and we r good to go. For a winger I wld use Perez or Aarons. Save the money for Thauvin. Abdennour and Austin Pliz. Charnely, Carr and Mcclaren make it happen. Sell Willo, Obertan, Marvuex, Goufrann and Abeid. is it true austin is at the hilton ??? We’ve agreed a £15m deal for Ibrahimovic.